In the evening, we always go down to the barnyard to take off fly masks and give everyone a goodnight treat. We walked casually over to Karma to check her out and see what our animal caregiver was talking about. When we saw her, she had a tiny foot coming out of her. She was having a baby! 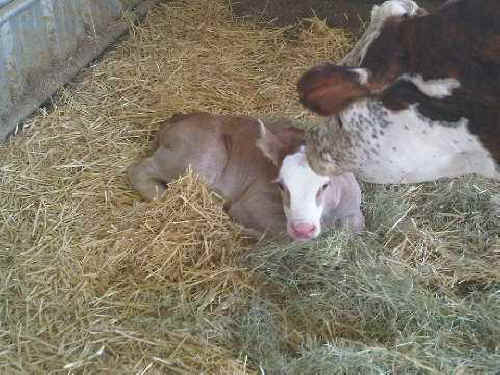 Holy cow/calf! We ran upstairs to grab our boots and cameras and rushed back down to the barn just in time to see the baby's tiny face come out along with the feet. Then, moments later she pushed him out and there at our feet lay a beautiful, strong, healthy surprise. Karma gave birth to a baby boy who, within minutes, was already trying to stand. We watched in amazement as Karma gently cleaned him off, as he stood and walked, as he took his first steps, nursed for his first time, and then fell asleep next to his exhausted but very happy mommy. When we took Karma from her prison last November filled with dead animals and filth, with no food or water, we not only saved her life and the life of her tiny baby, but unaware we saved the life of her unborn child as well. Now all three of them will live together in health, safety, and love for the rest of their lives at The Gentle Barn.